These chicken drummers are delicious served with rice and cucumber raita. 1. Combine the yogurt, tandoori spice blend, lime zest and juice and sunflower oil in a large bowl. Season with salt and pepper and add the chicken drumsticks, stirring to coat the chicken. Cover with cling film and marinate for at least 20 minutes to let the flavour infuse the chicken. 2. To make the cucumber raita, place the yogurt in a bowl with the garlic, lemon zest and juice, ginger and cumin. Stir to combine, then add the grated cucumber. Check the seasoning, then cover with cling film and set aside until needed. 4. Place the drumsticks on a roasting tray and roast in the oven for 10 minutes, shaking the tray once during that time. Reduce the oven temperature to 160°C/gas mark 3 and continue roasting for 20 minutes more, until the chicken is cooked through. 5. Meanwhile, cook the rice as per the packet instructions and keep warm. 6. Five minutes before the end of the chicken’s cooking time, add the spinach to the roasting tray and let it wilt in the oven. 7. 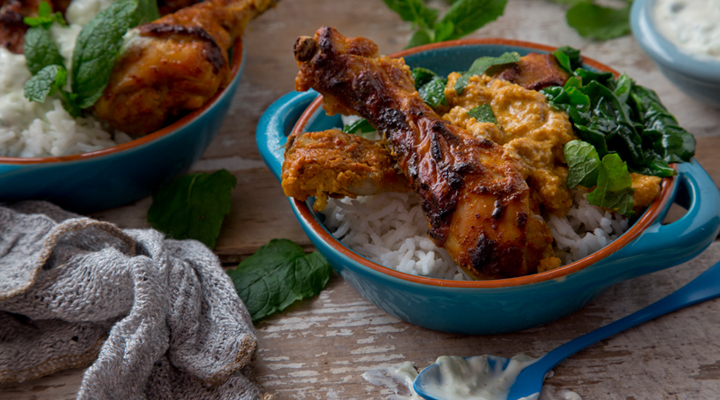 Serve the drumsticks with some rice and spinach with a drizzle of the cucumber raita.